Taste and comfort combine for the ultimate Best Western Plus Hood River Inn hospitality. Our hotel offers several styles of spacious suites including five deluxe Riverside Suites, configured in one, two, or three bedroom units. All suites are available for one night or extended stays. 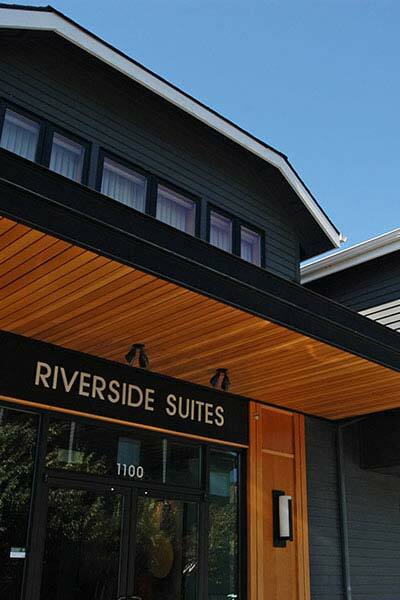 Riverside Suites are located on the north end of the Marketplace adjacent to the hotel, most with Columbia River views. The suites offer fully-equipped kitchens, tastefully furnished living spaces, and a bathroom for each bedroom. Each suite also includes an outdoor balcony or patio, large flat-screen HD TV with Surround Sound, and iPod docking stations. Riverside Suites offer fireplaces, while the non-standard unit is built to ADA standards for wheelchair accessibility. Each spacious suite features a unique floor plan, sleek, modern design with a Northwest Asian accent, and tasteful art. Many thoughtful extras, like whirlpool bathtubs and walk-in travertine showers will make your stay in Hood River one to remember. Our "in hotel" suites in the West or East Wing, offer varying amenities. These range from hospitality suites with separate bedrooms to junior suites to bridal suites with whirlpool baths and wet bars. ADA-accessible rooms feature details for sight, sound, or mobility-challenged guests. Inquire about the hotel suite that best suits your needs.